Boston Public Library and UMass Boston invite hip-hop enthusiasts of all ages to attend a free hip-hop event in the courtyard of the Central Library on Saturday, September 15, from 1-4 p.m. “I Emcee What You Did There” is the first in a series of hip-hop programs to take place at the Central Library and branches. Courtney Boston will host the event, with music by DJ Drew and performances by Red Shaydez, Mark Merren, First Lady Sarita, Sondro Castro, BYTC, Dasan Ahanu, and The Hangaz. The event includes a live hip-hop Jeopardy game. Additional programs are scheduled for Saturday, November 10, at Teen Central at the Central Library, and at the Codman Square and Grove Hall branches in spring 2019. “As we continue to build a collection at UMass Boston related to the history of hip-hop in Boston and Massachusetts,” said Carolyn Goldstein, “we are pleased that this grant from the National Endowment for the Humanities is providing opportunities for Boston’s hip-hop artists to share the legacy of these four hip-hop elements—music, dance, DJs, and graffiti—with a broad citywide audience at the Boston Public Library’s Central and branch libraries.” Goldstein is the grant’s principal investigator and Public History and Community Archives Program Manager in the Healey Library at UMass Boston. 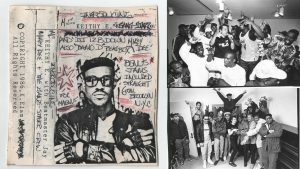 Since 2016, Boston Public Library and UMass Boston have been working together to preserve and share the history of hip-hop in Boston and Massachusetts. They continued their collaboration to expand awareness and access to the Massachusetts Hip-Hop Archive through a grant from the National Endowment for the Humanities and hosted the “Show ‘Em Whatcha Got” hip-hop digitization event on Saturday, May 19, at the Central Library. Attended by more than 200 members of the local hip-hop community, items collected for digitization included photos, clothing, videos interviews, and more, and will be available to view this month via openarchives.umb.edu. The Massachusetts Hip-Hop Archive is a collective of creatives, hip-hop enthusiasts, innovators, and community and state organizations united by a common passion and purpose to provide resources and opportunities to Boston's urban arts community. The Massachusetts Hip-Hop Archive includes a collection of almost 300 demo tapes featuring the biggest artists from Boston’s early hip-hop scene, which were digitized thanks to the support of the Boston Public Library. University Archives and Special Collections in the Healey Library at UMass Boston is currently working to expand the Massachusetts Hip-Hop Archive and welcomes donations of archival materials from musicians, DJs, breakdancers, graffiti artists, producers, promoters, and fans that will help document the rich heritage and legacy of hip-hop culture in Boston and Massachusetts. This event is presented in partnership through Boston Public Library and the Joseph P. Healey Library at UMass Boston, and made possible by a grant from the National Endowment for the Humanities: Exploring the human endeavor. #NEHCommonHeritage. Boston Public Library provides educational, cultural and civic enrichment, free to all, for the residents of Boston, Massachusetts and beyond, through its collections, services, programs, and spaces. Established in 1848, the Boston Public Library is a pioneer of public library service in America. It was the first large free municipal library in the United States, the first public library to lend books, the first to have a branch library, and the first to have a children’s room. As a City of Boston historic cultural institution, Boston Public Library today features a Central Library, twenty-five branches, a map center, business library, archival center; extensive special collections of rare books, manuscripts, photographs, and prints; and rich digital content and online services. The award-winning renovation of the Central Library in Copley Square, completed in 2016, together with new, renovated and historic branches, provide a transformed library system for the next generation of users. Boston Public Library enriches lives, hosting thousands of free educational programs and exhibitions, and provides free library services online and in-person to millions of people each year. To learn more, visit bpl.org.